Email encryption solutions are critical for protecting email containing sensitive information such as intellectual property, financial data or personal details. With today’s online and mobile society, confidential data is always on the move and always at risk. With one innocent click, years of product research, valuable intellectual property, and millions of pounds in account data can be lost through a simple email message. Easy to implement, manage and use, Smart IT Email Encryption is a scaleable, reliable and secure service which protects your most valuable and confidential data. 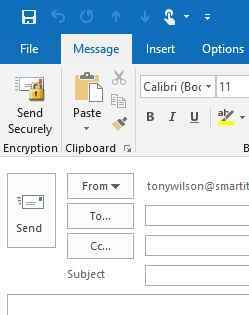 Add the ultimate message protection for you and your customers with Smart IT Email Encryption. End-users can trigger encryption by using a predefined tag in the email subject line. Encryption is compatible on any device, using any email client, including phones, tables, laptops, computers, etc.